The purpose of the Community Alert Sirens are to alert the citizens and the Volunteer Fire Department members of an emergency. While we rely on other forms of communication such as pagers and cell phones, they have their short comings. Batteries die, pagers and cell phones are not on the person, text messaging and smart phone apps like Active 911 are often delayed, with some calls not coming through at all. The National Fire Protection Association recommends that there are at least 2 reliable means to alert firefighters. The siren gets the firefighters attention at any time. It says to everyone, somebody needs help. When people in town hear the sirens, it tells them there’s an emergency going on somewhere and it helps with traffic. It warns citizens to be alert for volunteers responding to the firehouse and to watch out for fire trucks responding to an incident. When it’s your time of emergency, a siren reassures you that help is on the way! Like the distance to the closest fire hydrant, fire sirens also help with the cost of homeowner’s insurance, counting as points toward a better score on an Insurance Services Office evaluation. The higher the score given to the fire department, the lower the insurance costs to the homeowner. With consideration to the citizens, frequency of siren use, the duration of the siren noise and times when the fire siren is operated, are limited. 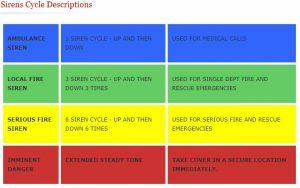 Primarily used between the hours of 6am and 10pm, there are rare occasions that the siren may be operated during the night time hours, such as a house fire, serious MVC or a call alerting multiple fire departments. The Community Alert Siren system is tested on the first Saturday of every month at noon by sounding the IMMINENT DANGER SIGNAL for 30 seconds followed by the all clear signal. Testing the sirens each month allows for maintenance and for familiarity in case of a real emergency. 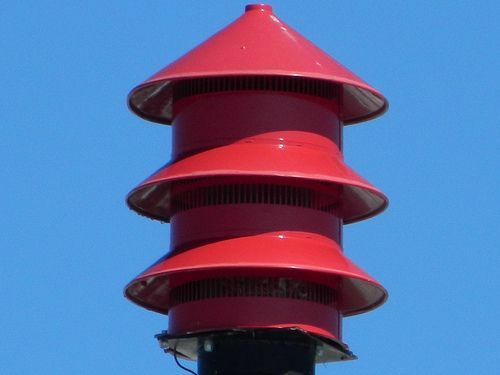 The sirens can be used in the event of some kind of attack or in the event of severe weather, like a hurricane or tornado. The “imminent danger” signal is a two-minute wavering tone that wavers faster and last much longer than the customary fire signal. The “all clear” signal is a steady, 30 second tone. The Easton Volunteer Fire Department provides “Service for Others” for the Town of Easton the surrounding area as well as mutual aid to neighboring departments. The 100% Volunteer staff responds to over 900 calls annually.